Coming back from Vancouver, we were greated by our favorite neighbour. This is Harley who loves having balls thrown for him (what dog doesn't) and tries to pass them through the fence for me to toss. 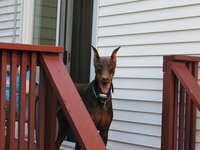 We were also quite happy to see his owner Lindsay, she is a great neighbour too, and was good enough to pick up our mail while we were away (we would of asked Harley, but he would of chewed on it). It was good to come back to friendly faces, as our return trip was long and tiring and we will never take the red eye back home again. I had very little sleep and we were both a bit punchy by time we got home at 8 a.m. Crawling into bed, I slept until 3, was up until 9 and crashed again (gotta love jet lag). Anyway, I digress. Let's start from the beginning. The flight was good out, as it was uneventful. I managed to get some knitting done, and was actually asked by a flight attendent if knitting needles were allowed! Luckily, I came prepared with a print out from of prohibited and permitted items. I was going to put a link to it on this entry, but as a plot to bomb planes with liquid explosives was revealed today, I couldn't find it on the internet (no doubt the list will be radically changed). Once we landed at Vancouver airport, we got our rental car (Pontiac G6), headed to the hotel (with various diversions due to lack of proper signage) and made our way to Costco. Why Costco, well Heather wanted to find out what the stir fry was like at the 'Resto' as it isn't available in Toronto. Unlike the hot dogs there which are always amazing, the stir fry was less than satisfactory. Being in a place like Richmond was is full of all kinds of Asian cuisine, it wasn't too surprising Costco fell flat. Oh well, we made up for it by doing some shoping that you wouldn't find in Toronto (everytime we find clothes we like at Costco, they are never bigger than a 'L'. At this location, they had mass quantities of 'XL' and we made the most of this situation). Heather's sister Helen and her husband Mike then called later asking us to go out to dinner with Helen's friends at Glowbal restaurant in Yaletown. It was trendy, noisy, but the food was delicious. Poor Helen and Mike had been in the air for 31 hours (travelling from Singapore via Sidney, Hong Kong, and San Francisco) but managed to go out for dinner. Me with my 3 hour jet lag was doppy and tired, while Mike was literally falling asleep at the table. 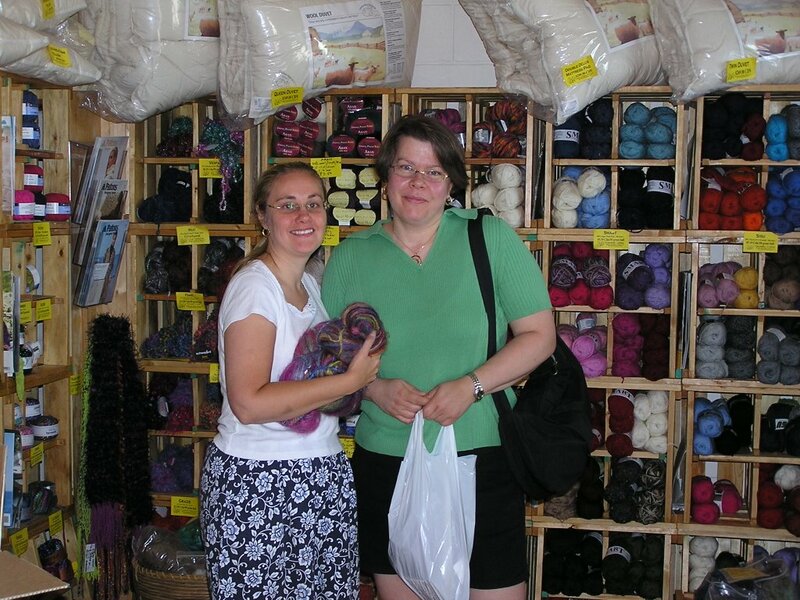 Day 2 was yarn day of our trip, as I wanted to check out the local wool shops. Diana at our office in Vancouver forwarded to me an article from Spun Magazine that gave out the scoop of the best places to trip out. Based on this advice, we headed first to Birkeland Bros. Wool on Main and King Edward. Wow, what a place. If you are a lover of wool and history, this is the place for you! The carting machine on site is over 90 years old and we met Norm Birkeland who is the second generation of the family who run this company. He was good enough to show us the machine, and tell us about it's history and it's workings. Just fascinating! 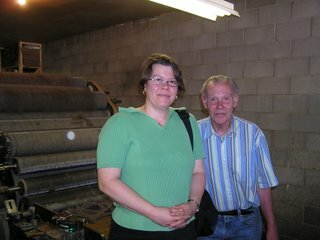 His daughter Cara, is the third generation working there, and she was just as friendly and helpful as her father. If I lived in Vancouver this would be one of my favorite stores. I don't think I could name one like it in Toronto, as it's history makes it unique upon itself. We then swung over to the west side of Vancouver to Dunbar street to look at a 'Touch of Wool'. Nice store in a great neighbourhood, but I didn't really see anything that stood out. Our final stop was at Urban Yarn in the Point Grey area. Loved this store as it seemed to be a cross between 'Village Yarns', 'Lettuce Knit' and 'Naked Sheep' in Toronto. Many interesting yarns to look at, but ultimately picked up a t-shirt that reads "She was quite a nice girl.....until all that knitting started". We snooped in and around the neighbourhood and found it to be very quite. It seems that with it being a long weekend, not too many people were around shopping. Helen and Mike told us later that they all were at Granville Market. After a brief rest everyone who was from out of town for Yvonne and Darren's wedding (the latter being Heather's cousin) went for dinner at a Greek restaurant (what else do you do in Richmond, which is predominately Asian). It was great to meet all of Heather's extended family, and put faces to so many names I had heard about. It was strange though, when Darren said he was leaving at 8 p.m. as he was tired and wanted to get ready for the big day tomorrow. It was less strange when about 15 minutes later, the entertainment came out. I don't know how Greek this would be, but a belly dancer performed some rather pervocative numbers. Here in the first pic, Heather's other cousin Doug is 'coerced' into doing a number with the dancer. I don't know how please his wife Peggy was with all of this, but everyone else found it wildly entertaining. In the second pic, Heather's Uncle Jimmy is encouraged to provide a 'tip' in the dancer's belt. 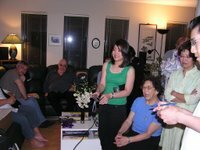 She was very good at her....job, and had several tips during the course of her performance. When we went back to Heather's Aunt Donna's house Darren mysteriously reappeared as his 'tiredness' had been overcome. It is too bad he missed all the fun, but we were able to show him what he missed through the magic of digital. Anyway, that will be it for now. The wedding day and the rest to come later. posted by shyknitter @ 2:34 p.m. I keep thinking the bellydancer is in the middle of a yarn store! Hadar met a woman near Guelph who is selling her yarn shop to concentrate on her bellydancing career! A wonderful trip it looks like, and Harley pleased to have you home!